The Wright-Kay Building, originally the Schwankovsky Temple of Music, is one of the oldest buildings in downtown Detroit, Michigan. It was completed in 1891, and sat on the growing fringe of Detroit's Woodward Ave. It is between Grand Circus Park and Campus Martius Park, at the corner of Woodward and John R. It was later used by the founders of Wright-Kay jewelry from 1920 to 1978. 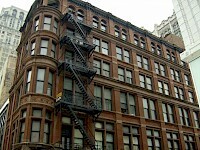 Its current use includes a nightclub on the first floor with offices and residential units above.